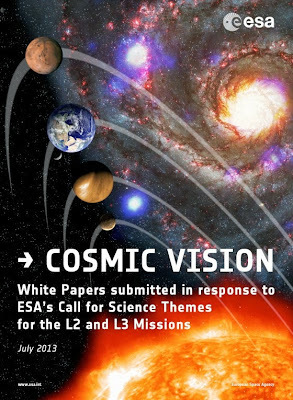 Last spring, the European Space Agency (ESA) put out a call for concepts for its next two €1 billion science missions. If history proves to be a guide, there’s a good chance that one of the selected concepts will be a solar system mission. ESA’s managers will announce their selection this coming November. These large European missions are particularly important because they have the resources both to reach targets throughout the solar system and to carry enough instruments to conduct wide ranging studies once there. If one of the solar system concepts is selected, we may get our first orbiter for Uranus, a return to Titan, or an orbiter and balloon for Venus. The range of concepts proposed shows that planetary exploration continues to have a wealth of possible missions. ESA breaks its science missions into three classes: Large (~€1B or $1.2B), medium (~€400M or $480M), and small (for which I couldn’t find a price target). For comparison, NASA also has three classes of missions: Discovery ($425M likely to become $500M), New Frontiers ($750M likely to become $1B), and Flagship (>$2B for the last three Flagship missions). Previously selected ESA Large missions (at one time called Cornerstone missions) show what can be done within the ESA budget. The Rosetta mission will conduct humanity’s first rendezvous and landing on a comet. The BepiColombo mission will be the equivalent of the Cassini mission to Mercury with a far more capable instrument suite than the Discovery-program MESSANGER currently at that planet. The JUICE mission will carry out extensive studies of Jupiter, flybys of Europa and Callisto, and will orbit Ganymede. ESA’s budget allows it to fly three Large missions every 20 years. In the past, ESA has balanced its large missions between astronomy/astrophysics and planetary missions. The first mission selection for the upcoming 20 year period, JUICE, is a solar system mission to launch in 2020. A second solar system mission in a row for the 2028 slot seems to me unlikely. A solar system mission for the 2034 mission seems likely, but ESA could pick a second astronomy mission in a row and restore the balance in the following 20 year period. I’ve looked through the astronomy/astrophysics concepts, and they are stiff competition for the solar system concepts. So no guarantees, but the list of solar system mission concepts is exciting, and I’m hopeful for one of the two slots going one of them. I’ve listed the mission concepts in order from the sun. None of the proposed concepts returns to the target of a previous ESA large mission. One though, returns to Mars where ESA will send its two ExoMars missions and two would return to Titan where the joint NASA/ESA Cassini/Huygens mission is conducted a descent and landing and continues to make frequent flybys. How may ESA decide among what are a number of exciting proposals? My guess is that three criteria will be used. First, would the mission fundamentally enrich our understanding of an important world or class of objects? Second, would a broad spectrum of the European planetary science community be involved? Third, would the mission be feasible within the budget target and with technology likely to be available? A mission to Uranus, for example, would greatly deepen our understanding the ice giant worlds. By studying the atmosphere, magnetosphere, and moons, it would involve a wide range of planetary science disciplines. However, a Uranus mission would need a radioactive power supply to produce electric power for the spacecraft. U.S. law prevents supplying plutonium 238 to other nations (and the supply is already critically low). ESA has proposed developing power supplies based on another radioactive element, americium, but that would represent a bet on an unproven technology. As you read through the list of proposals below, you might ask yourself how you would rank each according to these three criteria. If you decide to read the original mission concept proposals (130MB download), be prepared for a lack of detail in some of them. While NASA typically selects missions after detailed design studies and then launches in four to five years, ESA selects concepts far in advance of launch and fills in the details after selection. In addition, based on cost estimates from previous mission studies, some of the concepts as presented may well bust the €1B price cap. So it is possible that a selected concept would be scaled back as definition progresses. With this background, here are the solar system concepts. Where the concept title itself doesn’t summarize the goals, I’ve quoted a sentence or two from the proposal that captures the essence the concept’s goals. SOLARIS: SOLAR sail Investigation of the Sun “SOLARIS from its highly inclined orbit around the Sun, aims to combine helioseismic and magnetic observations, solar irradiance measurements and EUV images at various latitudes.” A solar sail would be used to place a spacecraft into an orbit close to the sun and eventually over the solar poles. Venus: A Natural Planetary Laboratory. Implementation: Two orbiters for atmospheric, surface, and interior measurements, balloon or unmanned aerial vehicle, short lifespan landers. Venus: Key to understanding the evolution of terrestrial planets. Single orbiter to study the atmosphere and surface, a balloon, and an optional atmospheric descent probe to measure the atmosphere and image the surface. Europe returns to Venus. Implementation: Single orbiter to study the atmosphere and surface and a balloon or unmanned aerial vehicle. Lunar Science as a Window into the Early History of the Solar System. Implementation: multiple penetrators to sample volatiles at the poles and a return of lunar samples. Science from the Farside of the Moon. Implementation: Multiple landers to conduct radio astronomy measurements and to measure the composition of the surface and surface impact rates. INSIDER - Interior of Primordial Asteroids and the Origins of Earths Water. “The scientific objectives of the proposed INSIDER mission require the exploration of diverse primordial asteroids - possibly the smallest surviving protoplanets of our Solar System - in order to constrain the earliest stages of planetesimal formation.” Implementation: Spacecraft to orbit several >100 km diameter main belt asteroids and a lander/rover to explore the surface of a volatile-rich asteroid. The Case for an ESA L-Class Mission to Volatile-Rich Asteroids. Explore one of the class of asteroids known as a main belt comet, which are in the asteroid belt but which have been observed to emit volatile gases like a comet. Determine if bodies like these could have been the source for Earth’s water. Implementation: Spacecraft to orbit one or more bodies. Possibly carry a lander or return a sample to Earth. In situ exploration of the giant planets and an entry probe concept for Saturn. “Comparative studies of the elemental enrichments and isotopic abundances measured on the four giant planets would provide unique insights into the processes at work within our planetary system at the time of giant planet formation.” Implementation: Put a probe into the atmosphere of Saturn, Uranus, or Neptune, with Saturn suggested as the highest priority. These two proposals would continue the exploration of these two moons following the Cassini mission. Fairly little detail is provided on implementation. The Exploration of Titan with an Orbiter and a Lake-Probe. Implementation: Saturn/Titan orbiter and a probe to land one of the polar lakes. The science goals and mission concept for a future exploration of Titan and Enceladus. Spacecraft delivers balloon to Titan and then performs multiple flybys of Enceladus before entering orbit around Titan. Giants (Jupiter and Saturn) in a number of ways and Uranus in particular is the most challenging to our understanding of planetary formation and evolution.” Implementation: Orbiter to observe Uranus remotely, explore its magnetosphere, and flyby all major moons. An atmospheric probe would study the structure and composition of the atmosphere. The ODINUS Mission Concept – The Scientific Case for a Mission to the Ice Giant Planets with Twin spacecraft to Unveil the History of our Solar System. Implementation: Two relatively modest spacecraft that would orbit Uranus and Neptune to allow comparative studies of these two ice giants and their systems of moons. Neptune and Triton: Essential Pieces of the Solar System Puzzle. “Neptune and Triton hold the keys to paradigm-changing advances in multiple fields of planetary science: Solar System and planetary formation, exoplanetary systems, geology and geophysics, atmospheric science, magnetospheric physics, and astrobiology.” Implementation: Neptune orbiter to observe that planet and perform multiple flybys of Neptune. Solar System Debris Disk. “The dynamical and compositional interrelations between dust, interplanetary meteoroids and their parent objects are still largely unknown… [This mission] will shed light on all these questions by mapping our solar system in dust, using the unique combination of in-situ dust measurements, analyses of returned samples, and a bird’s eye view for infrared observations of our outer “home” debris disk and beyond.” Implementation: Infrared telescope and a spacecraft that will analyze dust in-situ and return samples to Earth. Exploring Planetary Origins and Environments in the Infrared. “We propose an observatory--‐class ESA mission to provide spatially resolved infrared spectroscopy of solar system and planetary objects in all their guises, from their origins (remaining debris in our solar system and planet--‐forming discs around other stars) to their present--‐day appearance (atmospheres, surfaces and interactions with their host stars for planets in our solar system and beyond). Implementation: Space-based thermal infrared telescope. Several concepts propose telescopes that could observe exoplanets in addition to other targets. Only the concept below addresses exoplanet studies as its focus. Exploring Habitable Worlds beyond our Solar System. “Among the remarkable feats of the exoplanet community has been the ingenuity with which new observing techniques have been invented and put into successful use over the past twenty years. We now have a diverse set of tools at our disposal, with which we can explore different aspects of exoplanetary systems. A number of complementary approaches have been identified that can address habitability from different angles. Coronographs and infrared interferometers have been studied at some level of detail, and other more recent concepts (external occulters and integratedlight telescopes) also show considerable promise. While none of these is ready yet for flight, the rapid progress over the past few years in the development of the key enabling technologies gives confidence that an exoplanet exploration mission will become viable technically and financially in time for implementation in the middle of the next decade.” Implementation: Several possible approaches are given.